COMING SOON: ModernEyes Eyecare & Eyewear! We are super excited for the public’s first glimpse of our new office and image. ModernEyes is a new optometry practice, founded by myself (Dr. Kristin Reed) and my husband, Josh Reed. Our exterior signage is mostly installed and should be finished in the next day or two. We are currently waiting for our construction permits to come back so we can get the interior space built out. If all goes well, we will be ready to serve you in late summer or early fall of 2016. Be sure to check out our social media pages to stay updated on our progress! 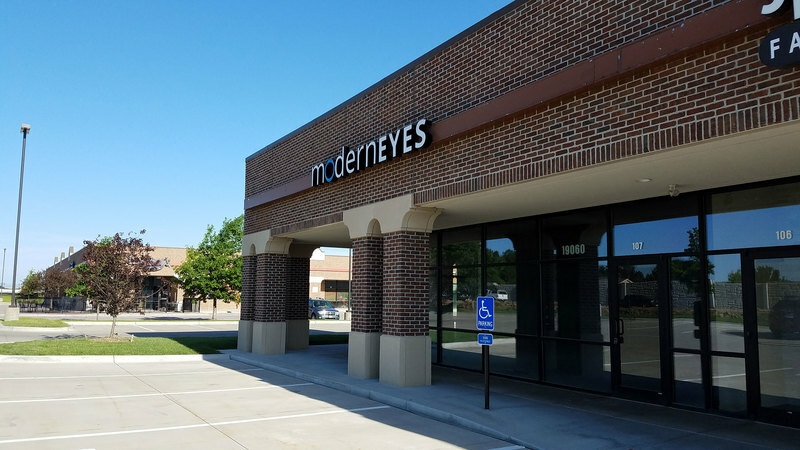 ModernEyes Eyecare & Eyewear is a new, locally-owned optometric practice. We will provide comprehensive eye health exams including diagnosis and management of many systemic and ocular health issues, contact lens fitting and assessments, and "red eye" (emergency eyecare) office visits for people of all ages. As an eyecare provider, I am committed to providing quality eye examinations and educating my patients on the importance of proper ocular health. I am also a provider for both InfantSEE and See To Learn examinations for children. In addition to educating my patients on proper eye health, I believe it is important to have stylish eyewear that you not only love, but that meets your lifestyle needs. At ModernEyes, you will find unique, quality frame lines for just about any budget. I earned my Doctorate of Optometry in 2013 from Southern College of Optometry in Memphis, Tennessee, after completing externship training in ocular disease, contact lens fittings, and vision therapy. During my time at Southern College of Optometry, I worked in the school’s on-site lab fabricating glasses for the patients of the school’s clinic. I completed my undergraduate work at the University of Nebraska-Lincoln in biological sciences. Go Huskers! Fun fact: I started undergraduate school knowing I wanted to pursue my dream of becoming an optometrist, so I was able to start optometry school after only three years of undergrad, before fully completing a bachelor’s degree. Originally from Papillion, Nebraska, I have really enjoyed being back in "The Good Life." Prior to establishing ModernEyes Eyecare & Eyewear, I worked as an independent doctor of optometry inside a relatively large retail chain. I have also worked part time for Special Care, a service that provides exams for nursing home residents, travelling on-site for their convenience and comfort. We can’t wait to meet you and hope you will connect with us on Facebook, Instagram, Twitter, Pinterest and on future blogs. Thanks for reading and see you soon!